Why do Chinese students study U.S. history? I wanted to believe, too, that Chinese students might be looking to the U.S. to learn how to criticize their own government – but that was less clear. Luckily, a colleague had warned me that Communist Party members would be participating in the seminar, likely attuned more to the students than to me. And, sure enough, they were there. (They did not state their affiliation but it was pretty clear.) Their presence made me notice my easy and continual criticism of the U.S., whether in discriminatory legislation toward immigrants or the incomplete fight for civil rights of African Americans. I soon realized that criticizing the U.S. was comfortable for everyone in the room. (The students and I differed, though, on graffiti: I saw it as an active form of political expression and they all – minus one – saw it as illegal activity that soiled public space rather than shaped a debate about it.) Once in the conversation about public space did I get the suggestion that there was some discomfort in thinking about what that meant in China. A loose mention of some activity a few years back stopped abruptly. (The protests in Tiananmen Square were clearly being referenced.) Public space holds politics quite differently in these two nations. So we look elsewhere to know ourselves, a longstanding pattern of thought. Given that I’m an American looking at the U.S., I think it’s critical to try to step outside that self-referential circle. Teaching U.S. cultural history in China enacted the ideas behind the debate to internationalize the study of the U.S. Encountering hubris is inevitable. So, too, is the re-thinking necessary to synthesize and translate what is well known. For me, that meant I needed to explain my assumptions about the impact of the present in shaping my questions of the past – the use of history in contemporary debate. The study of Chinese history is more often about long ago – there is so much to know – than the recent (still conflicted) past. So, too, I faced my acceptance of the assimilation of cultural history into other kinds of history (gender, diplomatic, political, etc. ), when cultural approaches are largely unknown in China. And, then, there was graffiti. 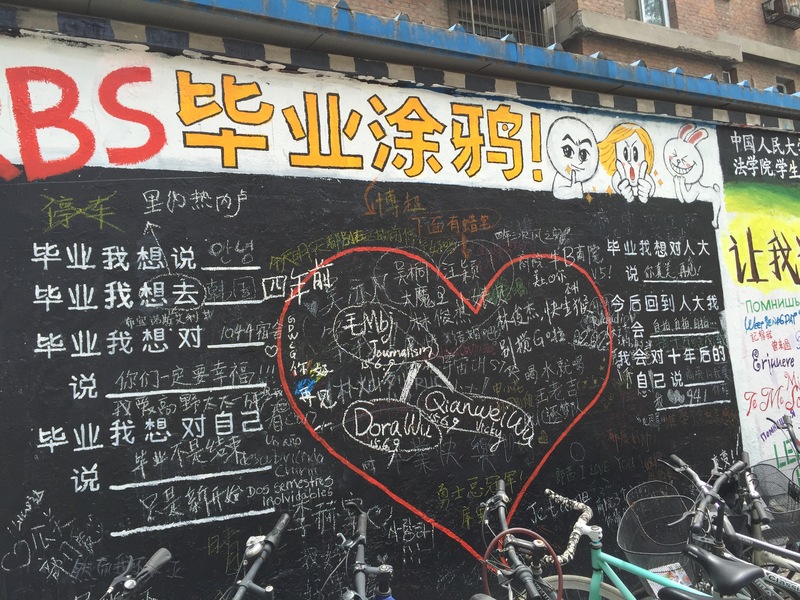 I assumed the students would agree with my statement that there was no graffiti in Beijing – particularly when faced with pictures of the tag-covered subways of the 1970s. They quickly dissented and pointed to the panels of graffiti at the university where students wrote messages about graduation (below). There was, perhaps, more to say about the politics of public space than I had allowed for.